If your parents are anything like my parents, they don't NEED anything, and never give you any gift ideas either. Mothers Day, Fathers Day and Birthday's become such a challenge! For the month of April I decided to post one no cost or low cost, yet meaningful or fun Mothers Day gift idea for your mother, or even your daughter every Monday. Last week I wrote about making your own "Where I'm From" gift. In today's digital world, our children are growing up learning to cook by reading recipes off their tablets or smart phones. This is great, but there is something missing in that. Something personal. There is just something about pulling out an old recipe card, with your mothers or grandmothers handwriting on it, faded some with age, and tattered a little from use that just makes the food taste better! It's the love, the heritage! A few months back, I ran across an old birthday card written to me years ago by my grandmother. Oh, how I had forgotten what her handwriting looked like. I recognized it instantly without having to read the signature on the card. It made me feel like I had a piece of her again. It may seem like a simple gift now. 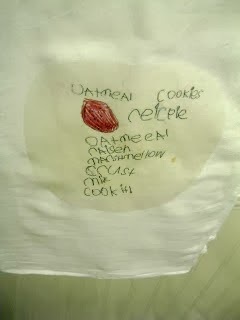 And even maybe underappreciated when you give a set of handwritten recipes to your daughter, grand daughter, or nieces. But life is that way. When we are young we don't always cherish what we should, but as we get older and lose our precious loved ones through the years, those simple gifts of time and thought become priceless and treasured. Here are a few of my favorite ways to share those recipes! Write them on cards, stack them up and tie a pretty ribbon around them. Write a note or better yet share a story of you learning to cook or when you burned something etc. They'll realize that no one starts out great. We all have beginners mishaps (ok even not so beginners mishaps too!) Encourage them, remind them of how food brings families together. Turn those recipes into kitchen towels! I have an old post from a few years ago that will show you how! 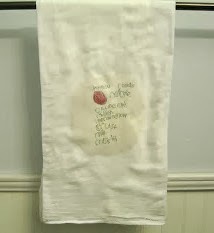 Recipe Dish Towels I have had children make them for their mothers or grandmothers writing "their" version of those favorite cookie recipes and I have made them for my Step mom for a mothers day gift from old family recipes also. Copy those handwritten recipes at a copy store and have them bound into small cookbooks. Share photo's and stories. 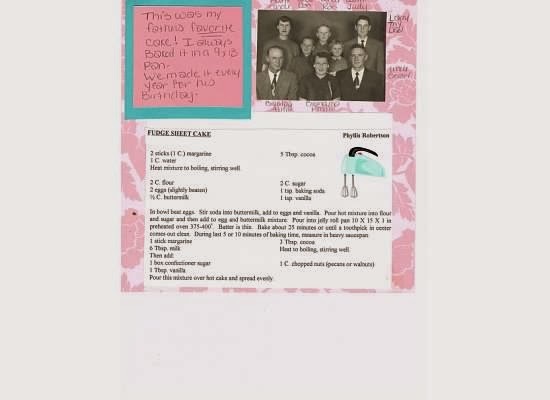 I recently made a scrapbook style cookbook for my daughter with preserved recipes, photo's and stories from both my side of the family and my husbands and was able to go back at least 4 generations. It took planning and asking relatives for recipes, photo's and stories. I took a year to do it, and gave it to her at Christmas. It's a one and only copy. I did manage to scan in every page to a photo website so I can print out a cookbook for my son's wives at some point. Yours doesn't have to be this ambitious, but printing a cookbook is a great way to share them with multiple people at once. What do you do to share your families treasured recipes?